hard questions regarding immorality that most previous mafia films refused to even acknowledge. Despite being blood brothers, the three Tempio boys are quite contrary in character, consequently resulting in constant family feuds among the brothers. Alpha-Mafioso Ray - who is the strongest and most intelligent of the brothers – clearly runs and holds the crime family together. Overweight Chez is a loose cannon of sorts and is easily the most deranged of the brothers, which is no surprise as the middle child usually tends to be the craziest. 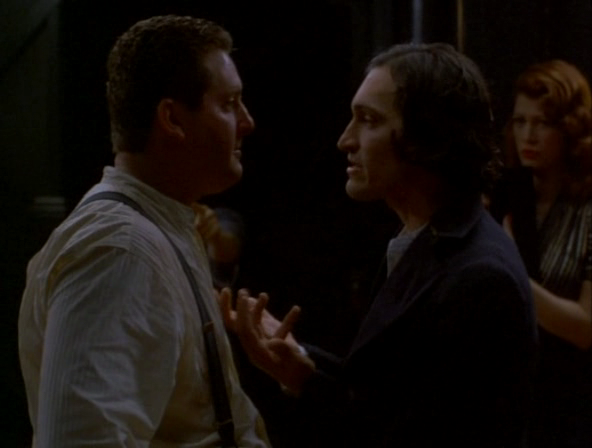 Due to his explicitly erratic performance as Chez in The Funeral, Chris Penn deservedly won Best Supporting Actor at the 2006 Venice Film Festival. 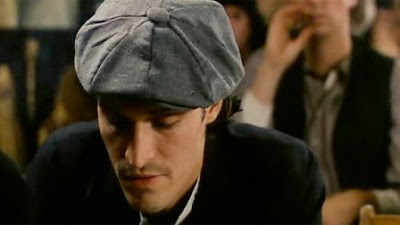 However, the strangest and most individualistically peculiar of the brothers is Johnny – a communist whose political idealism is glaringly detrimental to the family business. As indicated in the title of the film, The Funeral begins with the funeral of recently murdered Johnny, thereupon the rest of the film unravels the mystery behind his dubious death. I must admit that seeing Vincent Gallo (who is one of my favorite actors) laying in a coffin was something I found to be unintentionally humorous. Proving their true brotherly loyalty to Johnny; Ray and Chez proceed (albeit in totally different ways) to avenge their little brother's untimely death. 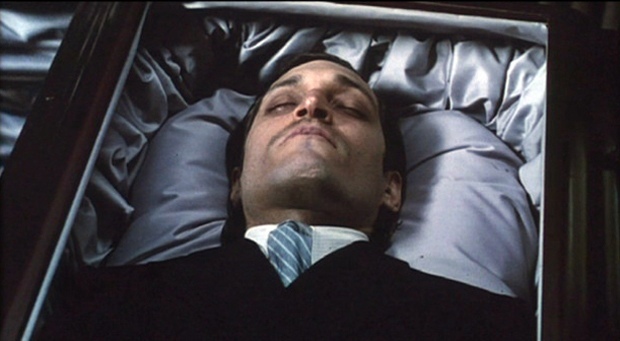 After the introductory funeral scene, The Funeral cuts back to the past, unfolding what led to Johnny’s death in the first place. It becomes clear that Johnny was bound to end up six foot under (as his brother Ray acknowledges to him as he lays dead in the coffin) – as he gave his brothers much grief due to his unruly behavior, on top of making numerous enemies due to his narcissistic and idealistic demeanor. Of course, the film eventually zooms back to the present, as Ray finds out who murdered his baby brother. At the tragic conclusion of The Funeral, all three brothers are finally vindicated of their family demons. 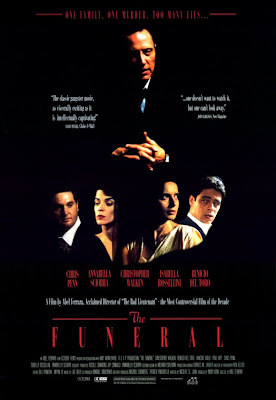 The Funeral is the ultimate anti-mafia film, as it creatively breaks every convention of the genre, thus reinventing the entire genre in the process. In fact, I would go as far as saying that The Funeral is "The Man Who Shot Liberty Valance (1962) of mafia films" - as both films are quite anarchistic in their defiance against the conventions of their respective genres. Personally, I have always wondered about the guilt and psychological insanity one must suffer as a mass-murdering career criminal, yet very few mafia films even begin to portray such serious, yet ultimately anti-romantic scenarios. Although the three brothers featured in The Funeral are exposed in the most unflattering of lights; the film also gives these characters a certain humanity that is often times lacking in the genre. The almost mystical stoicism that is so typical of characters in mafia films is destroyed in the best sense in The Funeral; a wonderful greaseball tragedy about a family that is genetically cursed. In fact, the source of the family curse is exposed in the film during a very stark and telling scene that signifies the loss of innocence among the three brothers. 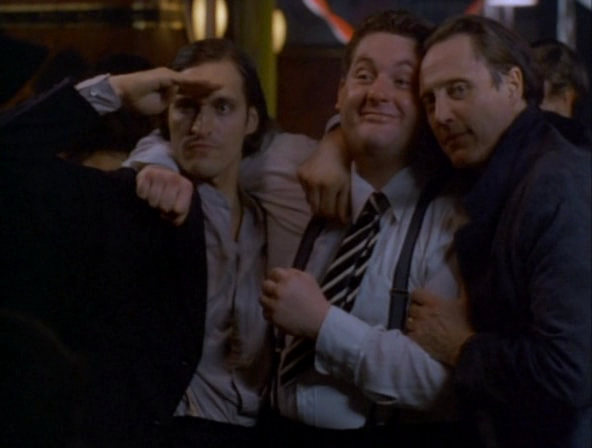 In this key scene, a flashback shows the three brothers as children under the corrupt guidance of their mafia thug father; a psychopathic delinquent who forces young Ray to shoot and kill a helpless man that is tied to a chair. After that life changing dark day (both figuratively and metaphorically), the three brothers have continuously suffered from the crimes of their father, thus inheriting his sins and maintaining his severely tainted legacy of criminality. All three men have their own way of coping with their hidden suffering: Johnny becomes a true believer in the Marxist internationalist working-class utopia dream, Chez is less stable in his suffering; outlandishly abusing women (accusing them of "selling their souls") in a feeble attempt to expel his inter self-hatred, and Roy stoically hides his suffering, until he confronts the young man that killed his younger brother. By the end of The Funeral, all three brothers meet their peace, henceforth leaving their already broken female companions to carry the burden, but isn’t that what families are for?